Description - All That Jazz vinyl planks combine durability and fashion for a truly unique look. Attractive wood looks with metallic veining, linear chevron patterns, and embossed wood looks make up this stunning series unlike anything you have seen before. Combining many uncommon looks, All That Jazz luxury vinyl plank series is sure to have something for everyone. Size – These Luxury Vinyl Planks are 7” wide x 48” long. Weight – Each 7” x 48” case weighs ~38 lb. Recommended Uses – All That Jazz vinyl plank collection is recommended for installation in high traffic environments such as offices, boutiques, shops, walkways, studios, break rooms, entryways, bedrooms, kitchens, and more. Beautiful styles in 7" x 48". 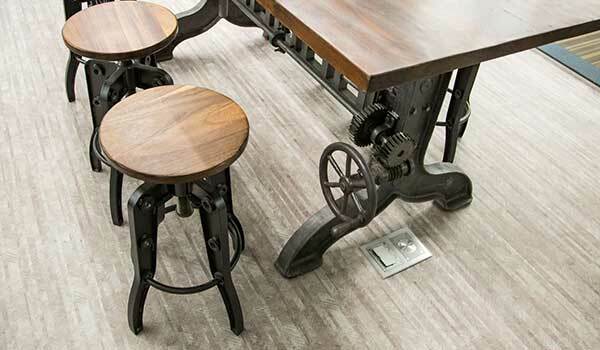 This flooring is put down in our custom built new office and we get compliments from vendors on it all the time! I personally LOVE the grey look and the combination with the herringbone/chevron look is super on point. It's the most unique flooring I've ever seen. I wanted something unique and kinda feminine for our new laundry room since I spend a lot of time doing laundry between our kids and my husband. Moonlight cocktail is the color I chose with the metallic gold flecks in it. Turned out beautiful! Such a unique, gorgeous flooring! I get compliments on my new floor ALL the time! The Yesterday All That Jazz Vinyl Planks are beautiful and unique - people are always asking where they came from! I finally get why everyone kept telling me to check out vinyl. So happy! !